Like any other organ in the human body, the heart is not invincible. Heart disease is a very dangerous problem and recent studies have indicated just how deadly of a killer it can be. It has been labeled as the number one killer of American adults with an astonishing 600,000 deaths each year. One of the scarier side effects of living with heart disease is the chance of suffering from a heart attack. Often this condition is associated with bone crushing pain in the chest with a sudden buckling of the knees. They scary truth is that the symptoms may be much more mild than what is portrayed in the movies. • Rapid and Irregular Heartbeat – Although this symptom can be associated with things such as anxiety, or stimulant usage, or just hard work, we felt like it was important especially if it was experienced in conjunction with other symptoms. • Chest Tightness – Many survivors of heart attacks describe the feeling as one of a constant squeeze – like an elephant standing on their chest or feeling overly full. • Odd Sweating – Cold sweats during a resting state where the skin is clammy and cold can be a sign of an imminent heart attack. • Sudden Fatigue – A rapid and sudden loss of energy, especially combined with any of the previously mentioned symptoms can absolutely be a sign of a heart attack in progress. It is an indicator that the body is not receiving the oxygen it needs. The heart is a vital organ that is unfortunately prone to many ailments. 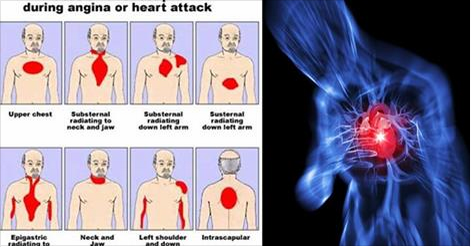 Many symptoms of a heart attack are shared symptoms with other disorders. The important thing to remember is that the body is capable of sending warning signs and when it does, we should listen.